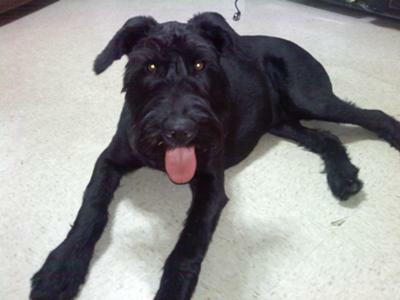 This is Maximilian (Max) the Giant Schnauzer. My husband and I wanted a dog, and my husband knew he wanted a Giant Schnauzer after discovering them at a dog show in England. We lived in the US so we got him from a breeder, and he is the best dog even though not alot of people in the US knew that Giant Schnauzers exist. My husband is in the military so I am home alone the majority of the year and I feel very safe with Max around. I made sure that he was properly socialized with people and other dogs when he was young so he is not aggressive, but no one messes with me when Max is around! His bark is loud and aggressive as warning to me that someone is coming to the house. He is BEAUTIFUL! I can see why you would feel safe with that big fella around!